Generates a raster from input vector and raster features, with fine control over symbolization and labeling, using the Mapnik toolkit. The MapnikRasterizer provides an interface to the Mapnik toolkit. It receives vector and/or raster input features and renders them as a raster image using cartographic styles based on the parameters selections. When placed in the workspace, a MapnikRasterizer has one input port, Connect Input. Features may be connected to this port, which creates a new input port for each item connected there. Multiple feature input feature streams may be connected to one input port, if they are to receive the same styling, and are the same geometry type - for example, connecting several types of roads to a single Roads port. The parameters dialog contains a table of Rendering Rules. Each Rule is composed of an Input Port, a Symbolizer, and Style. Multiple Rules may be created for one input port - for example, a Boundaries layer might be entered three times - once to style the lines, again to add a glow behind them, and again to create and style labels from an attribute. A variety of Symbolizers are available, including line, point, and polygon styles and patterning, text, shields, and point markers, as well as rasters. Each type has associated style choices. For many styling options, conditional values are permitted, where a table of test conditions may be created to assign varying values - colors or line widths, for example. Layers will be drawn in the order they appear in the Rendering Rules table - that is, the first item will be drawn first (at the bottom of the image), and subsequent items rendered over top of previous items. Ordering will determine how objects that overlap will appear - later items may cover earlier items. Note: Full symbolization details are available in the Mapnik documentation. Output rasters may be sized by defining their dimensions (number of columns and rows) or by specifying pixel size in ground units (horizontally and vertically). The ground extents covered by the raster default to the extent of all the input features, but can be specified. If specified extents are smaller than the extent of the data, it will be clipped to the defined area. Raster Interpretation Type may be either RGB24 or RGBA32 (with alpha). The background of the raster can be either a specified color, or an image to be tiled over the extent of the raster. To use a georeferenced raster as the entire background, it should be connected to an input port and styled using the Rendering Rules and a Raster symbolizer (not attached as the Background Image). All source datasets are routed into a MapnikRasterizer. creating new input ports when required by connecting to the Connect Input port. Note that all three of the food vendor datasets are connected to the same port - they are all point geometry, and will all be styled the same way. 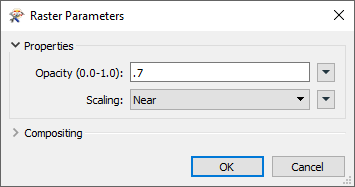 In the parameters dialog, we set the output raster size to be based on one (1) meter pixels (cells), and construct the Rendering Rules table. GEOTIFF (the orthophoto) goes first, to provide a background for the output raster. It is styled with a Raster symbolizer. Opacity is set to .7, to fade the image a bit and allow the rest of the features stand out. Parks are next, styled with a Polygon symbolizer. They are filled green, and Opacity set to .5. If we wanted to draw a contrasting border around the parks, we would duplicate the rule, and use a Line symbolizer to style the border. Bike_ALL contains the bike paths, with attributes. We have created two rules for them (using the copy and paste tools below the table) - note that they do not appear together in the table, and are separated by the FoodVendors layer. The first rule styles the lines, and the second performs labeling. Food vendor symbols may overlap the lines, but will appear behind any bike path labels they may collide with. To generate the labels, we select the PathName attribute. The Halo Fill parameter produces a glow behind the letters, making them more visible against the background and other features. FoodVendors contains all three of the point datasets attached to this input port. Renaming a port in the Rendering Rules table is reflected in the transformer itself - this port was created when Hot Dogs was attached to Connect Input, and then renamed in here. This layer is styled with a Point symbolizer. By choosing Symbol Type, Image, we can select a symbol raster to be used - in this case, an orange marker that has been saved as a PNG file with a transparent background. The symbol was scaled to the appropriate size by using the Transform parameter, scale(.25). Full documentation of all styling parameter choices and behaviour can be found in the Mapnik documentation. The raster is produced according to the parameter selections. FME has an extensive selection of transformers for working with raster data. 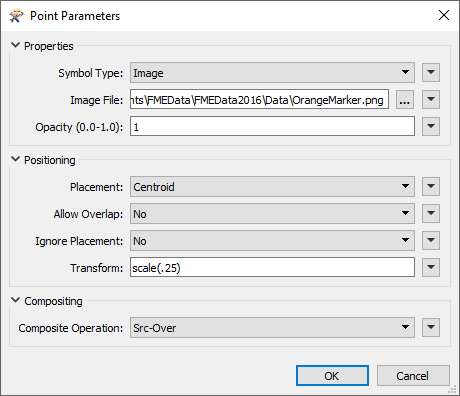 They can be generally categorized as working with whole rasters, bands, cells or palettes, and those designed for workflow control or combing raster with vector data. For information on raster geometry and properties, see Rasters (IFMERaster). These transformers generally apply to whole rasters. RasterCellOriginSetter Sets the raster's cell origin. Applies a convolution filter (sometimes called a kernel or lens) to raster features and outputs the results. RasterExpressionEvaluator Evaluates expressions on each cell in a raster or pair of rasters, including algebraic operations and conditional statements. RasterExtentsCoercer Replaces the geometry of input raster features with a polygon covering the extents of the raster. RasterGCPExtractor Extracts the coordinate system and the Ground Control Points (GCP) from the raster feature and exposes them as attributes. RasterGCPSetter Sets the Ground Control Points (GCP) on a raster with the specified Column (pixel), Row (line), X Coordinate, Y Coordinate and Z Coordinate. RasterGeoreferencer Georeferences a raster using the specified parameters. RasterHillshader Generates a shaded relief effect, useful for visualizing terrain. Alters the underlying interpretation of the bands of the raster geometry on the input features, using the specified conversion options. For example, an input raster feature with three bands of interpretation (UInt16, Gray8, and Real64) could be converted to a raster feature with three bands of interpretation (Red8, Green8, and Blue8) or four bands of interpretation (Red16, Green16, Blue16, and Alpha16) in a single operation. RasterMosaicker Merges multiple raster features into a single raster feature. RasterPropertyExtractor Extracts the geometry properties of a raster feature and exposes them as attributes. RasterPyramider Resamples rasters to multiple resolutions, based on either number of levels or dimensions of the smallest output raster. RasterResampler Resamples rasters, based on specified output dimensions, cell size in ground units, or percentage of original, and interpolates new cell values. Applies the raster rotation angle on the input raster properties to the rest of the raster properties and data values. The expected input is a raster with a non-zero rotation angle and the expected output is a rotated raster with a rotation angle of 0.0. It is expected that the input raster properties will be modified to conform the output raster properties for a raster rotated by the given angle. Applying a rotation angle is primarily done for compatibility with other processing and writers that cannot handle a rotation angle. RasterSubsetter Clips raster features using pixel bounds instead of ground coordinates, and optionally adds cells around the perimeter. RasterTiler Splits each input raster into a series of tiles by specifying either a tile size in cells/pixels or the number of tiles. RasterToPolygonCoercer Creates polygons from input raster features. One polygon is output for each contiguous area of pixels with the same value in the input raster. WebMapTiler Creates a series of image tiles that can be utilized by web mapping applications such as Bing™ Maps, Google Maps™, or Web Map Tile Service. This is done by resampling rasters to various different resolutions and then splitting them into tiles. These transformers generally apply to bands. RasterBandAdder Adds a new band to a raster feature. RasterBandCombiner Merges coincidental raster features into a single output raster feature, preserving and appending all bands. Alters the interpretation type of individual raster bands, converting cell values if necessary. Removes all unselected bands from a raster feature. RasterBandMinMaxExtractor Extracts the minimum and maximum band values, palette keys, and palette values from a raster feature, and adds them to a list attribute. RasterBandNameSetter Sets the band name of selected bands on a raster, making raster contents simpler to understand compared to band numbers. RasterBandNodataRemover Removes the existing nodata identifier from selected bands of a raster feature. Any values previously equal to the nodata value are considered valid data. RasterBandNodataSetter Sets a new nodata value on selected bands of a raster feature. RasterBandOrderer Specifies the required order of bands in a raster. Bands are reordered according to the input band indices. RasterBandPropertyExtractor Extracts the band and palette properties of a raster feature and exposes them as attributes. RasterBandRemover Removes any selected bands from a raster feature. RasterBandSeparator Separates bands or unique band and palette combinations, and outputs either individual raster features or a single new raster feature containing all combinations. RasterStatisticsCalculator Calculates statistics on raster bands and adds the results as attributes. These transformers generally apply to individual cells. 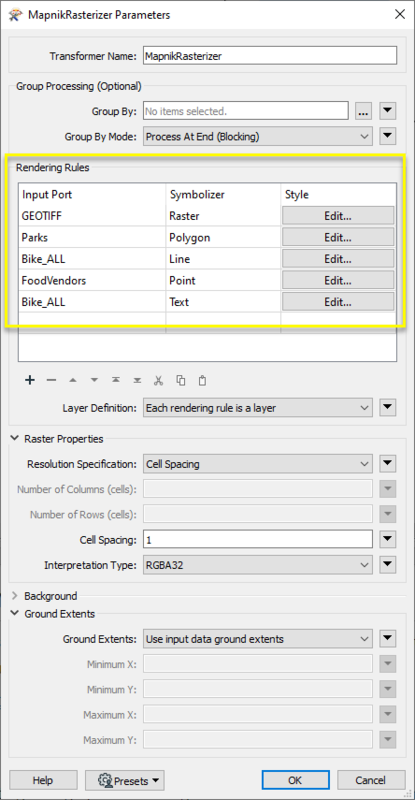 Calculates the aspect (direction of slope) for each cell of a raster. Aspect is measured in degrees from 0 to 360, clockwise from north. RasterCellCoercer Creates individual points or polygons for each cell in a raster, optionally extracting band values as z coordinates or attributes. RasterCellValueCalculator Evaluates basic arithmetic , minimum, maximum or average operations on the cell values of a pair of rasters. RasterCellValueReplacer Replaces a range of band values in a raster with a new single value. RasterCellValueRounder Rounds off raster cell values. RasterSingularCellValueCalculator Performs basic arithmetic operations on the cell values of a raster against a numeric value. RasterSlopeCalculator Calculates the slope (maximum rate of change in z) for each cell of a raster. These transformers generally apply to palettes. Creates a palette from an attribute, and adds this palette to all selected bands on a raster. RasterPaletteExtractor Creates a string representation of an existing palette on a raster and saves it to an attribute. RasterPaletteGenerator Generates a palette out of the selected band(s) of a raster. The output raster will have the selected band(s) replaced by a new band with a palette. Alters the interpretation type of raster palettes. Identifies the palette key that matches a raster band’s nodata value, and sets a value on it. RasterPaletteRemover Removes selected palette(s) from raster features. RasterPaletteResolver Resolves the palette(s) on a raster by replacing cell values with their corresponding palette values. Palette values with multiple components, such as RGB, are broken down and the individual values assigned to multiple, newly-added bands. These transformers generally control the flow of features in a workspace. RasterCheckpointer Sets a checkpoint in the raster processing which forces previous processing to occur immediately. Once complete, it saves the current state to disk. RasterConsumer Requests the tile(s) from the raster geometry but no actual operations are performed on the tile(s). RasterExtractor Serializes the geometry of the feature into the Blob Attribute based on the selected writer format. 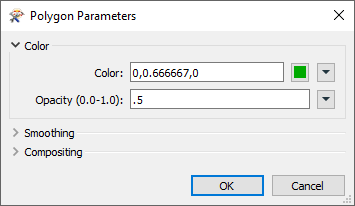 RasterNumericCreator Creates a feature with a raster of the specified size with a numeric value and sends it into the workspace for processing. It is useful for creating a very large image with a user-specified width and height. RasterReplacer Replaces the geometry of the feature with the geometry held in the Blob Attribute. The blob is decoded according to the selected raster format. RasterRGBCreator Creates a feature with a raster of the specified size with an RGB value and sends it into the workspace for processing. Selects specific bands and palettes of a raster for subsequent transformer operations. These transformers generally involve using rasters and vector data together. ImageRasterizer Creates a raster representation of vector or point cloud input features, using the fme_color attribute over a solid background fill for vector features. Point clouds may be rendered using their color or intensity components. NumericRasterizer Draws input point, line and polygon features onto a numeric raster filled with the background value. The Z coordinates of the input vector features are used to generate pixel values. Features without Z coordinates will be discarded. MapnikRasterizer Generates a raster from input vector and raster features, with fine control over symbolization and labeling, using the Mapnik toolkit. PointOnRasterValueExtractor Extracts the band and palette values from a raster at the location of one or more input points and sets them as attributes on the feature. VectorOnRasterOverlayer Rasterizes vector or point cloud features onto an existing raster. For vector features the fme_color attribute sets pixel color, and point clouds may be rendered using their color or intensity components. Input ports are created by either connecting a feature stream to the Connect Input port, or by adding them in the Rendering Rules table, Input Port column. Input ports may also be renamed, moved, and deleted in the Rendering Rules table. The raster(s) drawn from a group of features according to the parameter selections. Invalid features that will not be included in the output raster. Rejected Feature Handling: can be set to either terminate the translation or continue running when it encounters a rejected feature. This setting is available both as a default FME option and as a workspace parameter. If the Group By parameter is set to an attribute list, one raster per group will be produced. Select a level of parallel processing to apply. Default is No Parallelism. Note: How parallel processing works with FME: see About Parallel Processing for detailed information. This parameter determines whether or not the transformer should perform the work across parallel processes. If it is enabled, a process will be launched for each group specified by the Group By parameter. For example, on a quad-core machine, minimal parallelism will result in two simultaneous FME processes. Extreme parallelism on an 8-core machine would result in 16 simultaneous processes. You can experiment with this feature and view the information in the Windows Task Manager and the Workbench Log window. No: This is the default behavior. Processing will only occur in this transformer once all input is present. By Group: This transformer will process input groups in order. Changes of the value of the Group By parameter on the input stream will trigger batch processing on the currently accumulating group. This will improve overall speed if groups are large/complex, but could cause undesired behavior if input groups are not truly ordered. Specifically, on a two input-port transformer, "in order" means that an entire group must reach both ports before the next group reaches either port, for the transformer to work as expected. This may take careful consideration in a workspace, and should not be confused with both port's input streams being ordered individually, but not synchronously. Using Ordered input can provide performance gains in some scenarios, however, it is not always preferable, or even possible. Consider the following when using it, with both one- and two-input transformers. Single Datasets/Feature Types: Are generally the optimal candidates for Ordered processing. If you know that the dataset is correctly ordered by the Group By attribute, using Input is Ordered By can improve performance, depending on the size and complexity of the data. If the input is coming from a database, using ORDER BY in a SQL statement to have the database pre-order the data can be an extremely effective way to improve performance. Consider using a Database Readers with a SQL statement, or the SQLCreator transformer. Multiple Datasets/Feature Types: Since all features matching a Group By value need to arrive before any features (of any feature type or dataset) belonging to the next group, using Ordering with multiple feature types is more complicated than processing a single feature type. Multiple feature types and features from multiple datasets will not generally naturally occur in the correct order. One approach is to send all features through a Sorter, sorting on the expected Group By attribute. The Sorter is a feature-holding transformer, collecting all input features, performing the sort, and then releasing them all. They can then be sent through an appropriate filter (TestFilter, AttributeFilter, GeometryFilter, or others), which are not feature-holding, and will release the features one at a time to the transformer using Input is Ordered By, now in the expected order. The processing overhead of sorting and filtering may negate the performance gains you will get from using Input is Ordered By. In this case, using Group By without using Input is Ordered By may be the equivalent and simpler approach. In all cases when using Input is Ordered By, if you are not sure that the incoming features are properly ordered, they should be sorted (if a single feature type), or sorted and then filtered (for more than one feature or geometry type). As with many scenarios, testing different approaches in your workspace with your data is the only definitive way to identify performance gains. This table defines the layers and symbolizers that specify how features will be rendered. Each entry in the table contains an input port, a symbolizer type, and the parameters for that symbolizer. The symbolizer parameters depend on the symbolizer type. Descriptions of the parameters for each symbolizer may be found in the Mapnik documentation. Note that layers will be rendered in the order they are specified. The first layer in this table will be rendered first (that is, it will appear below any subsequent layers). Rules may be duplicated to add additional styling. Input Port The name of the layer, also reflected in the transformer in the workspace. Multiple feature streams may be connected to a single input port, should be the same geometry type, and will have identical styling. 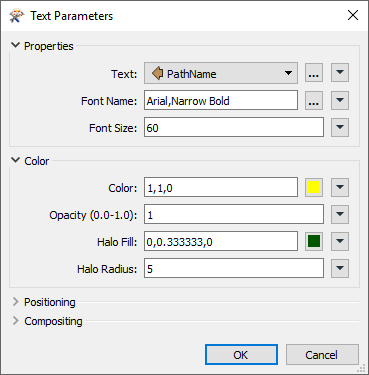 Style Edit… will open a parameters dialog specific to the Symbolizer type. 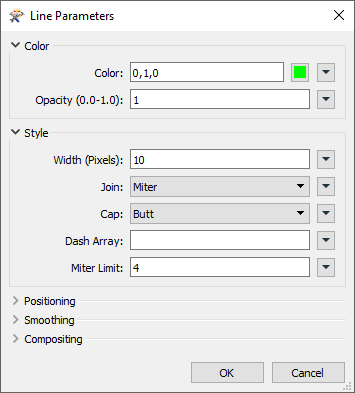 This parameter specifies what defines a layer. Each rendering rule is a layer Each individual rule in the above table will be rendered as a separate layer. Each input port is a layer Each input port will be rendered as a layer. Note that some layers will contain multiple symbolizers in this case. Essentially, this determines the draw order of the rendering rules. Layers are rendered in order, with all features for a layer drawn before any features of the next layer. Within a layer, symbolizers are applied feature-by-feature. 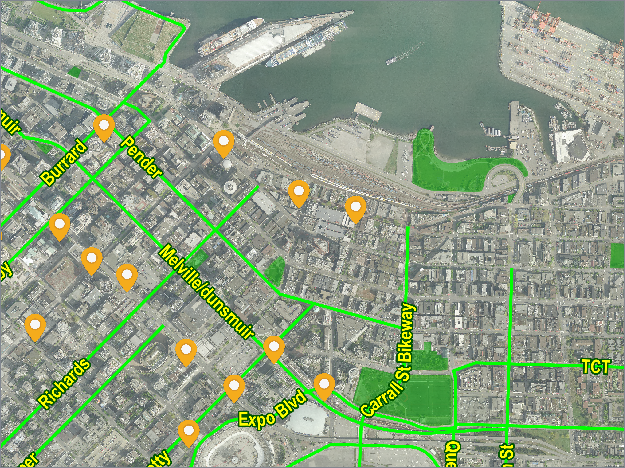 Example: You have line features representing streets, and each feature also contains an attribute specifying the street name. To render this, you could set up a Line symbolizer and a Text symbolizer. In this case, you would want to draw all the streets first, then have all the labels on top of those, so Each rendering rule is a layer would be more appropriate. Example: You have overlapping polygons, and want to draw each with a border. To render this, you could set up a Polygon symbolizer and a Line symbolizer. In this case, you would want to draw each feature as both a polygon and a line before moving on to the next feature, so Each input port is a layer would be more appropriate. Note that the behavior of Each rendering rule is a layer can be replicated when Layer Definition is set to Each input port is a layer. To do this, just add a new input port for each separate layer. Columns and Rows: Size by a fixed number of cells (pixels) horizontally and vertically. Spacing: Calculate size based on the dimensions, horizontally and vertically, of a single cell (pixel) in ground units. Number of Columns (cells) If Size Specification is Columns and Rows, enter the width of the output raster in cells (pixels). Number of Rows (cells) If Size Specification is Columns and Rows, enter the height of the output raster in cells (pixels). Cell Spacing If Size Specification is Spacing, enter the width of the output raster cells, measured in ground units. The background may be filled with a solid color and/or image. If neither a color nor image is specified, the background will be transparent. Use the color picker to the right of the text field, or edit the contents of the field directly. The color must be specified as <red>,<green>,<blue> where each of <red>, <green>, and <blue> is a number between 0 and 1. Sets the alpha value for the background color. It must be a number between 0 and 1, where 0 is fully transparent and 1 is fully opaque. Select an image file to be used as the background. If the image is smaller than the extent of the output raster, it will be tiled. Georeferencing will not be honored for background images - to use a georeferenced raster, connect it to an input port and use the Rendering Rules table. If Use input data ground extents, the extents are not explicitly specified, and the output raster extents will be determined by the union of the bounding boxes of the valid input vector features. If Specify ground extents, the remaining Ground Extents parameters are used to specify the extents of the output raster. The output raster will be clipped to the specified extents. Minimum X This specifies the minimum x value of the output raster. It is used when the Ground Extents parameter is set to Specify ground extents. Minimum Y This specifies the minimum y value of the output raster. It is used when the Ground Extents parameter is set to Specify ground extents. Maximum X This specifies the maximum x value of the output raster. It is used when the Ground Extents parameter is set to Specify ground extents. Maximum Y This specifies the maximum y value of the output raster. It is used when the Ground Extents parameter is set to Specify ground extents. 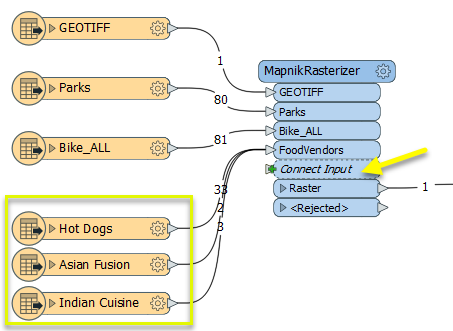 Search for all results about the MapnikRasterizer on the FME Community.